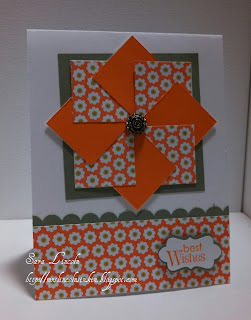 Today's video is of the Pinwheel card that i posted early this week. You can check that post out here. Here are the measurements again in case you missed them. For your Pinwheel you will need two pieces of scrap card stock at 2 5/8" x 2 5/8". One piece of colored card stock cut at 3" x 3" and then 8 squares (one a DSP and one a solid) cut at 1 1/4" x 1 1/4". The bottom piece of DSP that i used was cut at 1 1/2" x 4 1/4".